Six months after the triple disaster of earthquake, tsunami, and liquefaction that hit Central Sulawesi, the temporary health facility built by MSF in the Dolo Selatan Sub-District continues to serve the affected communities. When the health centre of Baluase was heavily damaged by the disaster, it left 12 villages without access to medical care. Aside from providing medical and mobile health care services, the MSF local team, in coordination with the heads of the Baluase health centre and the Sigi District health agency, decided to construct a temporary centre with an outpatient, maternity, and emergency departments, and water and toilet facilities. Meet Dr Adelide Krisnawati Borman, or Dr Krisna. 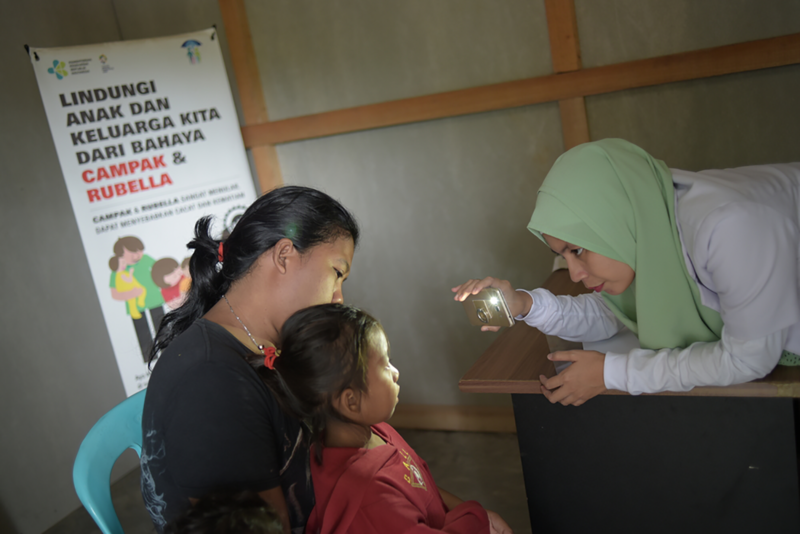 She is the head of the Baluase Health Centre, in South Dolo Sub-district, Central Sulawesi. Dr Krisna said that this health centre covers 12 villages. It receives around 20 to 30 outpatients per day and 5 to 10 are admitted as inpatients daily. Since November 2018 when medical services started, the facility received more than 3,000 patients in all. Here is a nurse at the Baluase temporary health facility checking the patient’s vital signs. Dr Krisna emphasised that the Baluase temporary centre built by MSF has all the needed facilities. It has the outpatient, maternity, and emergency departments, even water and toilet facilities. This is one of the rooms at the temporary health facility, used for the inpatients. This facility also has a pharmacy where the patients can get their medicines after consulting the doctor. Dr Krisna added that they can deliver health services every day, conduct outpatient care, and polyclinic for children. “There is a pharmacy, obstetrics, an emergency, and inpatients room. We also have a pantry where we can cook and there are also toilets. We thank God that we were helped by this temporary building built by MSF. We are very grateful and it is very useful for all of us and the people here,” she said. Zariyah, a mother, took her son to the temporary health centre two days ago. The son has been admitted to the inpatient department due to fever. “I’m happy with this temporary health facility because it is close to my house,” she said. According to Dr Krisna, her staff were happy to continue delivering health services to the communities using MSF’s temporary health centre. She said that at first, they did not expect that the building would be very well made. But after its construction, they were able to restart their medical services in less than a month. “We will probably use it for a year more,” Dr Krisna said with the hope that the damaged health centre will be renovated soon.